Entasi fabric tensioned displays are designed to be durable, practical, and attractive. Entasi 10 Foot fabric vertical curve display with full graphic. Each display is made from a lightweight aluminum tube frame, and is covered with a high-quality fabric graphic. Optional accessories include mounted photographic panels, heavy-duty shelf, and display lights. 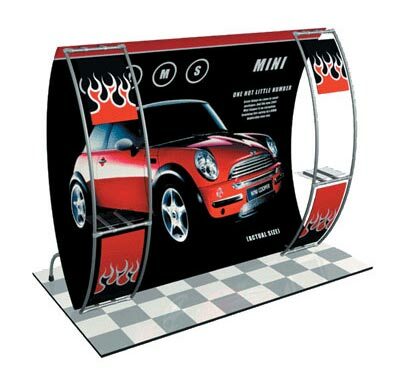 Impress customers at your next trade show with Moss' 10' fabric booths!